The last blog article looked at often-expressed concerns (and anecdotal evidence) suggesting our congregations are aging, failing to attract younger age-groups, and missing leaders-in-their-prime. This article looks at four churches—from various regions of the country—and examines specific data on aging in these churches. 11% of respondents reported being between 45 and 54 years of age. 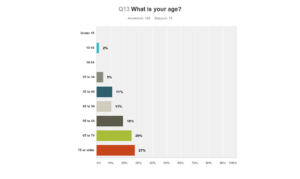 But there were almost four times as many females in this age-group as males (only 4 of 178 respondents reported being males between 45 and 54). This congregation is not attracting younger believers. Men in their prime leadership years are absent. Membership as a whole is aging—ten years from now, a large majority of this church will be over 65. What do these data indicate for the future of this church? This congregation (about 450 in attendance on Sunday mornings) is one of the largest congregations of Churches of Christ on the east coast. They have a long history of strong leadership and excellent pulpit leadership. They have attempted (creatively and assertively) to reach younger audiences. IMP partnered with this congregation for over a year as they went through a transition in pulpit leadership. As might be expected, the “age” issue was not as pronounced in this church as in Case #1. Still, this congregation is facing several challenges with the age of its membership. 331 members (almost 75% of the church) responded to our assessment. Over one-fourth of respondents reported being between 45 and 54 years of age (a good indicator). 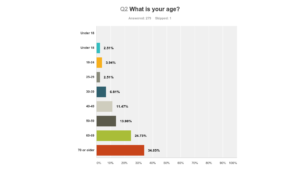 Only a third of that age-group, however, were males (32 of 331 respondents reported being males between 45 and 54). This congregation is doing a better job of attracting younger believers, but still not at a rate that could be considered “sustainable” in the long run. (They have almost as many members who are 75 and older as members 25 and younger. Given that research indicates the vast majority of people make significant spiritual faith and church commitments before the age of 25, this statistic is even more telling.) Once again, males in their prime leadership years are underrepresented. (Why are there twice as many females in this age-group as males?) In ten years, a large majority of this church will be over 55. Unless they can find a way to attract and assimilate younger believers in the next ten years, the future of this church is in question. This congregation (about 450 in attendance on Sunday mornings) is located in the mid-West. They have a long history of peace and harmony and have enjoyed strong, effective pulpit leadership. On the retirement of their long-tenured minister, IMP conducted an “Interim Season Seminar” with this congregation to determine whether they wanted to use our services or launch a search on their own. The elders, in this instance, decided to take a DIY approach. One-fourth of respondents were between 40 and 60 years of age. 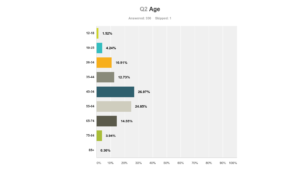 Once again, however, just over a third of that age-group were males (only 10 male respondents were between the ages of 39 and 50). As with Case #1, this congregation is finding it difficult to attract younger believers. (They have more members 70 or older than members under 50.) Again, males in their prime leadership years are underrepresented. In ten years, a large majority of this church will be over 70 years of age. What do these findings say about the future of this church? Only 30 respondents fell within that critical, prime-leadership-age-group of between 45 and 54 years of age. In this instance, half (16) were male. Once again, this congregation is finding it difficult to attract younger believers. 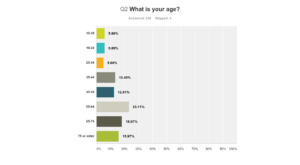 (Of 242 respondents, only 40 people were less than 35 years of age.) Like the other instances we’ve examined, this is an aging church What do these findings say about the future? These specific cases have much in common—they are all graying churches with challenges attracting younger generations of believers. Not every congregation served by IMP faces the same degree of challenge in this regard. (We could provide data on several churches with younger demographics.) But this particular challenge is common in many churches of every stripe. Congregations all over the country are struggling with similar issues, to greater or lesser degree. If you want to reach (or target) younger audiences, your congregation must address future members, with different concerns and preferences. Know the age of your congregation’s members. Do your own “age assessment.” Analyze how old your members are and where there might be gaps in or under-representation of various age groups. Decide as a leadership whether this is an issue your congregation needs (or is willing) to seriously address. Promote significant leadership roles for younger members. Many congregational leadership roles are currently (and understandably) occupied by older members. However, the absence of younger voices in congregational leadership hinders awareness of and advocacy for the concerns and sensibilities of younger members. Recognize (if you belong to a congregation with significant aging problems) that your church is probably “doing church” in a manner perfectly suited to attracting the age of members you presently have. Recognize (if you belong to a congregation with significant aging problems) that your church is probably “doing church” in a manner perfectly suited to attracting the age of members you presently have. Without changing your church system (worship, language, ministries, fellowship), you are not likely to affect the balance of ages in your congregation. To find a younger audience, your congregation will need to make some fundamental adjustments. 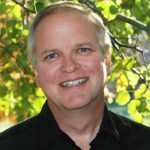 Conduct a serious conversation in your congregation about “target audience.” Most churches operate on the unspoken assumption that pleasing current members (often older and long-tenured), respecting their comfort zones, accommodating to their preferences and customs is a basic and immutable principle. If you want to reach (or target) younger audiences, your congregation must address future members, with different concerns and preferences. Not many church members are willing to do this. That’s OK. Just don’t expect to keep doing the same thing, yet experience different results.